August 2015 – Observer’s Challenge Report: Click on the following link. About 30 mostly faint stars could be counted, with a greater concentration on the NNW edge. 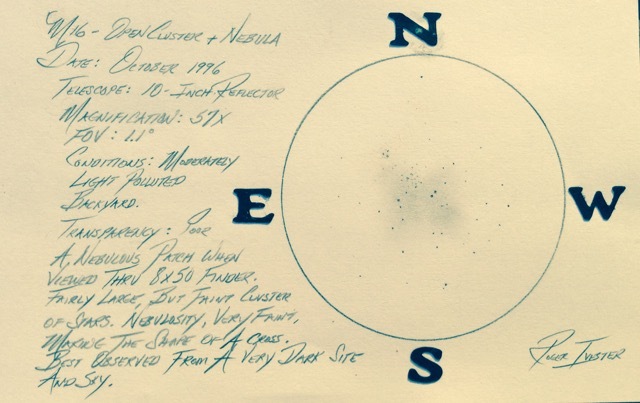 A pair of 8th magnitude stars located on the W side. A faint and small triangle of mostly equal stars located just outside the nebula on the NNE edge. The nebula is mostly faint. 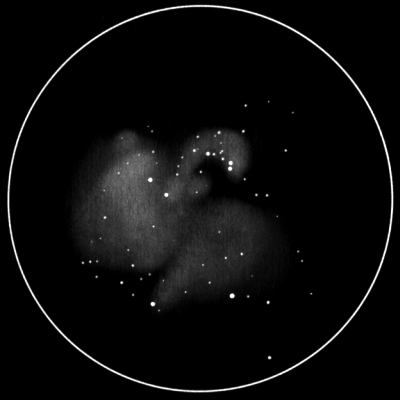 When using averted vision and patience, the nebula makes a cross shape, as seen in the following pencil sketch. Easily seen with an 8 x 50 finder appearing as a faint nebulous patch. My backyard is a poor location to observe this object, as ambient lighting from a couple unshielded streetlights are located in close proximity to my observing site. This object would be best observed from a true dark site and with the use of an O-III or UHC filter. About 15 stars counted, with a prominent double star located on the western edge. 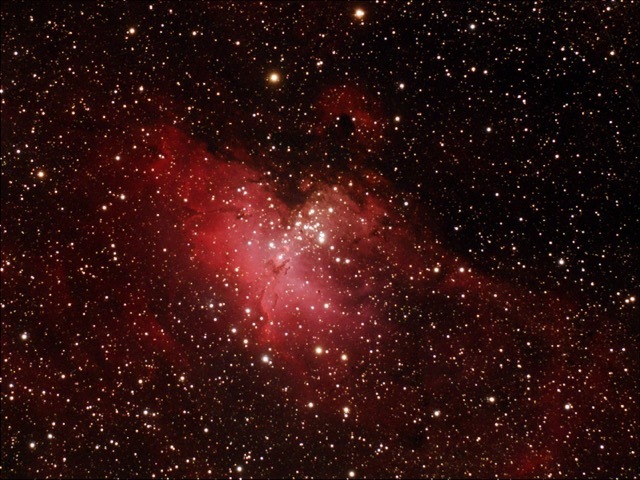 The surrounding nebula is very faint and appears without a definite shape, encompassing the cluster. A faint and small triangle of stars is located on N edge. This entry was posted on August 29, 2015 at 12:15 am and is filed under Work File Only - Observer's Challenge Reports. You can subscribe via RSS 2.0 feed to this post's comments.